National Peanut Butter Day may or may not be tomorrow. I'm not sure if it's an actual holiday, but I have definitely heard some rumors. Even if it's not a thing, you can use the idea as an excuse to indulge in jars and jars of peanut butter. I know I will. These cookies taste similar to the peanut butter chocolate chip cookies I posted a while ago, which are basically chocolate chip cookies with peanut butter mixed into the batter. 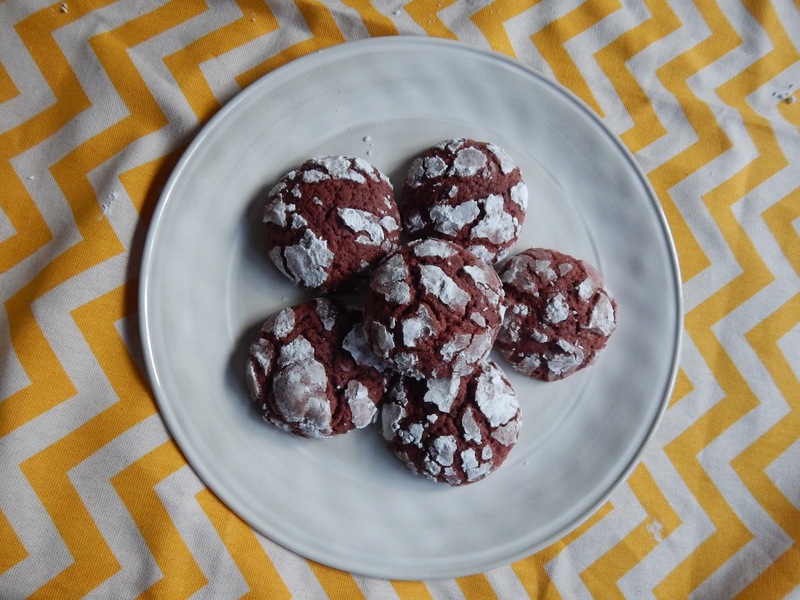 These cookies are a little different, but definitely in a good way because they have swirls. They just look so pretty, and you get a lot more chocolate. You have to make two doughs to get the swirl, but it's worth the extra effort. The first dough is a chocolate chocolate chip cookie dough. No, that's not a typo. It's chocolate cookie dough with chocolate chips mixed in, hence the two chocolates. The second dough is a peanut butter chocolate chip cookie dough like the one in the recipe I published earlier. It's not the same dough because I doubt it would bake similarly to the chocolate chocolate chip dough, but it tastes about the same. I just add chocolate chips, but some chopped toasted peanuts would be crunchy and delicious, too, especially if you use salted peanuts, which would add an interesting sweet and salty contrast. The peanut butter dough doesn't bake quite as quickly as the chocolate chocolate chip dough, though, so you get to pick if you want regular peanut butter cookies mixed with crispy chocolate cookies or regular chocolate cookies with gooey peanut butter cookies. Another option (which I took full advantage of) is baking a few plain ones (one type of dough/not swirled) of each. You can bake the chocolate chocolate chip cookies a little less or the peanut butter chocolate chip ones a little bit more so you get the same texture in both. It also lets any cookie lovers with nut allergies try some as well (just be careful not to cross-contaminate with measuring spoons, cookie scoops, etc.). These cookies are absolutely addictive, and everyone should be able to try them. For the chocolate chocolate chip cookie dough, beat the butter, sugar, and brown sugar together until fluffy. Add the egg, vanilla, and milk. Combine the flour, cocoa, baking soda, and salt, then stir into the dough mixture. Fold in the chocolate chips. Scoop into 50 walnut-sized balls and chill until firm. For the peanut butter chocolate chip cookie dough, beat the butter, sugar, and brown sugar together until fluffy. Add the peanut butter, egg, and vanilla. 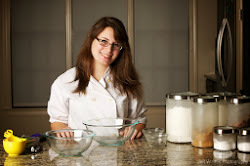 Combine the flour, baking soda, and salt, then stir into the dough mixture. Fold in the chocolate chips. Scoop into 50 walnut-sized balls and chill until firm. Roll a ball of each dough together. Bake for 10 minutes or until set and golden. There are few things that will impress your Valentine's Day date more than a delicious home-cooked meal. You've probably got dessert covered (if not, you can try any of these recipes), but what should you make for the main course? Definitely something flavorful. It's got to be creative, but it can't be too crazy. It also has to look presentable. After all, you eat with your eyes first. Luckily for you, I have the perfect idea--spicy honey lime chicken skewers. You probably have most of the ingredients already, and it is incredibly easy to make. All you have to do to impress your date is cut up some chicken, stick it in a marinade overnight, and grill it up the next day. There's even a three-ingredient sauce that you literally just stir together. The marinade focuses on three main flavors: sweet, spicy, and sour. There's a bit of saltiness as well from the soy sauce, but the components all work in harmony to make a delicious dish. I like lime as my citrus for the sour component, but oranges would be amazing, too. I find that I need about two limes to get enough juice and zest for the recipe, but I recommend buying one or two extras to use when plating. Honey gives a hint of sweetness, which cools off the spiciness, and it makes the chicken caramelize beautifully on the grill. The skewers will get pretty dark, but make sure you don't burn them. As for the spiciness, I find that the Sriracha is irreplaceable. If it's not enough heat for you, feel free to throw in some pieces of habeñero or jalapeño when you blend the marinade together. I thread the chicken onto skewers for a more impressive presentation, but cooking skewers can be a bit tricky. If you use wooden skewers, make sure you soak them in water for a few hours before grilling. It reduces the likelihood of them catching on fire or burning. Metal skewers will work just as well, but they retain heat longer, so be careful not to burn yourself when eating. I choose to cut up an onion to keep the chicken pieces from sticking together and help them cook better, but you can substitute your favorite vegetable or forgo one entirely. If you want to bypass the trouble of cooking skewers, you can always use the marinade on whatever cut of chicken you want and either sear it or roast it. You can even heat up a wok and cook small pieces of chicken that way, too. I whip up a quick and easy sauce to serve with the chicken for a little extra flavor, but it consists of the three main flavors in the marinade to complement the chicken rather than distract from it. It really doesn't get easier than whisking honey, lime juice, and sriracha together. I personally prefer a sriracha to honey ratio of two to one with a splash of lime juice, but you can taste it and adjust the proportions to fit your taste. 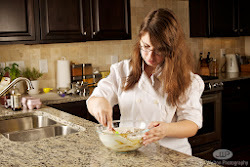 Although this is such a simple recipe, it is bound to impress your date! In the bowl of a food processor or blender, pulse the soy sauce, 1/3 cup honey, oil, lime zest, 3 T lime juice, garlic, ginger, and 2 T Sriracha until smooth. Cut the chicken into small pieces and toss with the marinade. Let sit overnight. Cut the onion into large pieces. Alternate pieces of onion and pieces of chicken on wooden skewers. Combine the remaining honey, lime juice, and Sriracha. Grill the chicken skewers until deep brown and cooked through. Serve with sauce. I have decided where I want to go to college, and, though I won't tell you which one, the school's color is red. 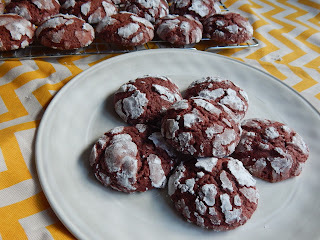 I decided to celebrate by making red velvet crinkle cookies, which are also perfect for Valentine's Day. You can make them for your significant other. You can whip up a batch for your potential valentine. You can make them for yourself, wrap yourself in a blanket, and watch a Netflix marathon while inhaling a few dozen. I won't judge. To me, what makes red velvet desserts red velvet is a hint of cocoa, a splash of buttermilk, and a good dose of red dye. Red velvet cake (or cupcakes) is a classic, but the flavors translate easily to cookies. The texture is cakey but still crisp on the outside from the powdered sugar, which magically creates a thin shell that shatters when you bite into it. 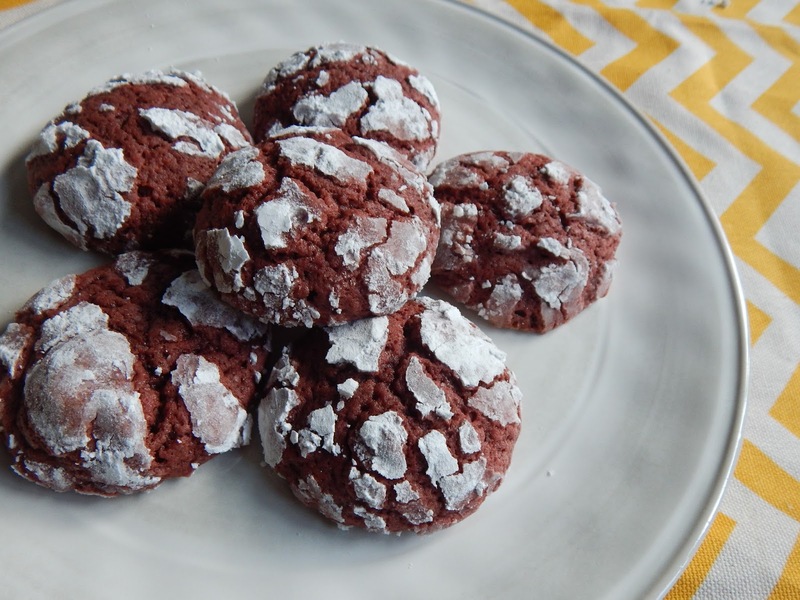 The powdered sugar also adds a hint of sweetness; the cookies themselves aren't particularly sweet, so the combination is delicious. The trick to the crinkle part of crinkle cookies is the powdered sugar (it's kind of the not-so-secret ingredient in the recipe). Everyone kept saying how fancy the cookies looked and asking how long it took me to make them. Honestly, you just roll the dough in powdered sugar and they bake like that without any extra effort on your part. 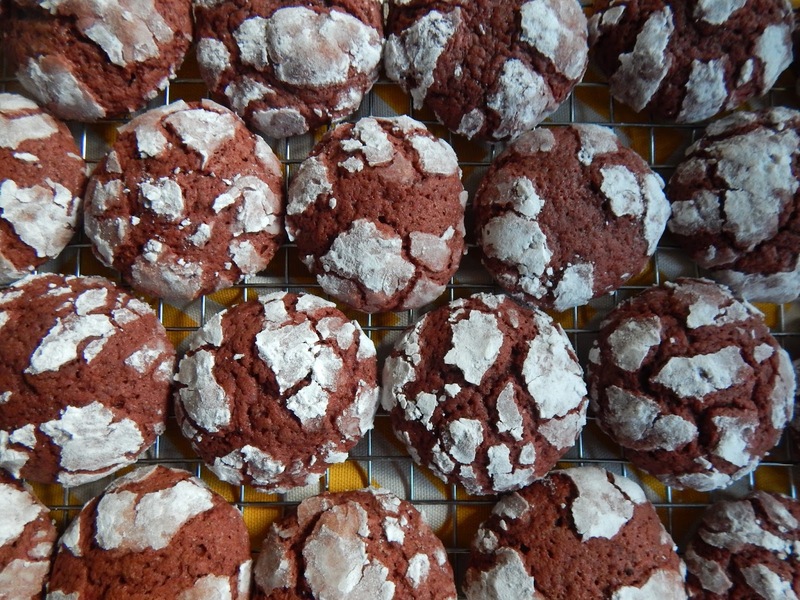 As the cookies puff up and expand in the oven, the powdered sugar sticks to the original surface of the dough, resulting in crackly patches of sugar. Just make sure you coat the dough generously in the powdered sugar so that you get distinct white patches. Sift the flour, cocoa, baking powder, baking soda, and salt together. Beat the butter and sugar together until fluffy. Beat in the eggs one at a time, then add the buttermilk, vanilla, and dye. Stir in the flour mixture. Chill the dough for 1 hour or until firm. Scoop the dough into balls. 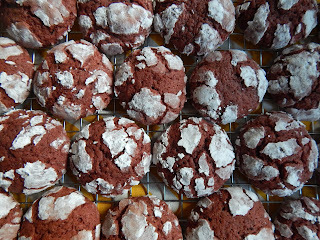 Roll in the powdered sugar, place on the prepared trays, and bake for 10 minutes.